Shirley Anita St. Hill Chisholm (November 30, 1924 to January 1, 2005) was an American politician, educator, and author. She was a Congresswoman, representing New York's 12th Congressional District for seven terms from 1969 to 1983. In 1968, she became the first African-American woman elected to Congress. 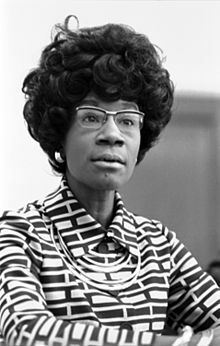 On January 25, 1972, she became the first major-party black candidate for President of the United States and the first woman to run for the Democratic presidential nomination (US Senator Margaret Chase Smith had previously run for the 1964 Republican presidential nomination). She received 152 first-ballot votes at the 1972 Democratic National Convention.